The kids had a couple days off of school in October for some reason, so we decided to take a trip to Utah to visit some family and friends. Utah has a plethora of marathons, so as long as we were in Utah I figured I should sign up for one. The Layton Marathon’s date and location fell nicely within our trip plans. 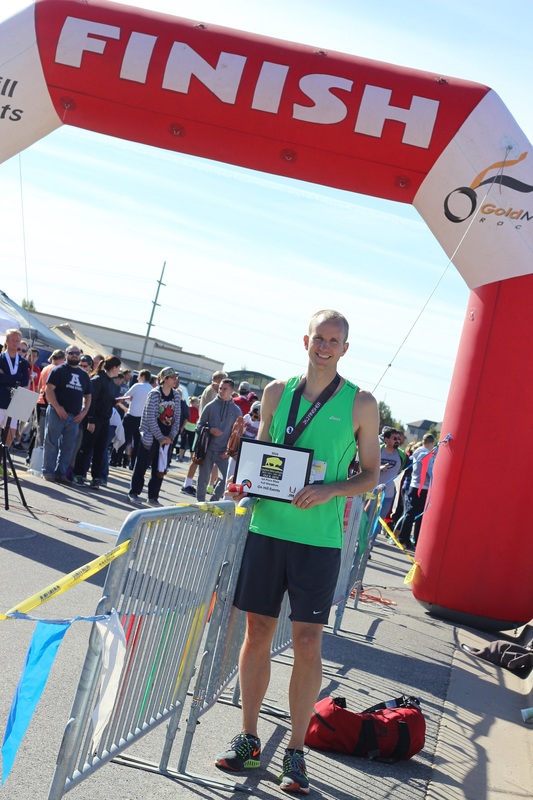 I debated whether I wanted to interrupt training to run a marathon, but ultimately I decided to pull the trigger as I know I have a long winter training season ahead of me and I really wanted to do three marathons this year. Cyndi, our five kids, and I drove down to Utah after work on Wednesday night. We arrived at my brother’s house after midnight and I got to sleep around 12:40am. Of course, the kids were up before 7:30am (they had slept in the car) and I wasn’t in my own bed, so I didn’t exactly sleep well. I did a 4.25 mile recovery run with a few striders that morning. 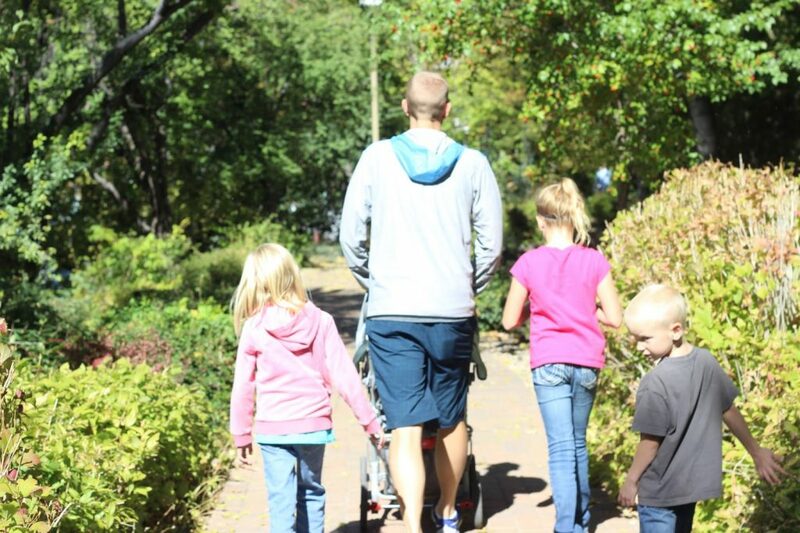 Then we went to the BYU campus (our alma mater) and walked across campus in search of a geocache. We stopped at the science building and the Bean Museum as well. By the time we were back at our car I was pretty exhausted. I caught a 5 minute nap at home, but that was it. Thursday evening we headed to our friends’ house to play games until about midnight (I lost our game of Caverna). Then our 16 month old decided not to sleep, so once again it was a not-so-restful night. I told Cyndi I couldn’t do a walking tour that day as I wanted to have some chance at a decent marathon on Saturday. Luckily we found a good deal on a bounce house place, so we let the kids play for a couple hours while we mostly relaxed and watched. We then ate lunch at Costa Vida and I ate WAY too much (my full chicken burrito, 1/4 of Paisley’s burrito, and a little of Cyndi’s salad). We ate dinner at Grandma’s and I tried to take it easy, but I still ate too much given the large lunch I had eaten. We headed to my cousin’s house and I topped it off with a couple chocolate chip cookies. I also lost by one point in a competitive game of Settlers of Catan — complete with the Cities and Knights and Seafarers expansions. My cousin lives right by Layton, so we stopped at packet pickup before we got there. Packet pickup wasn’t too fancy — I got my shirt, my bib, a couple granola bars, and some safety pins. There wasn’t actually a packet with decent coupons or anything special. Fortunately the baby slept well on Friday night, so I got almost 5 hours of sleep. I was counting on caffeinated Clif Bloks at this point. The alarm sounded at 4:10am and Cyndi kindly drove me to the bus pick up at 4:45. We could have used a little more guidance on where the buses were going to be, but we figured it out and I was able to hop on the first bus (which I like to do for first bathroom access — especially after engorging myself the previous day). At this point I will note that the Layton Marathon website isn’t too great. It is pretty bare bones and confusing to navigate. It left off some information like whether there would be a bag drop-off and if and where gels would be handed out on the course. Not too big a deal, but it was probably my main organizational complaint. Drink plenty of fluids — more than you think you need. As race time approached I stripped down to my tank top, shorts, and knit gloves. It was really cold, but I knew I’d warm up pretty quickly. I was secretly hoping for a PR — perhaps a pace of ~6:45/mi to beat my PR of 6:48/mile. However, I was concerned about my lack of sleep and how my recent training would translate into marathon performance. 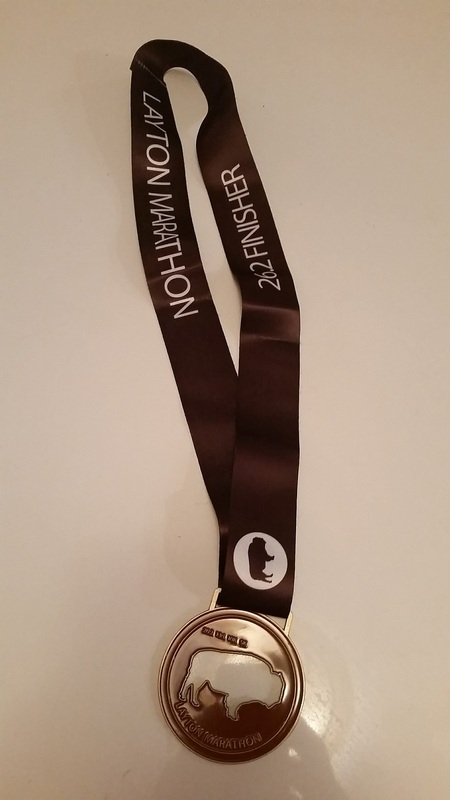 I’d clocked a lot of miles recently, but my last marathon, Morgan Valley Marathon, was just over two months before. I finished in 3:00:08 at Morgan Valley, so I hoped I’d do better at ~1000 feet lower altitude. 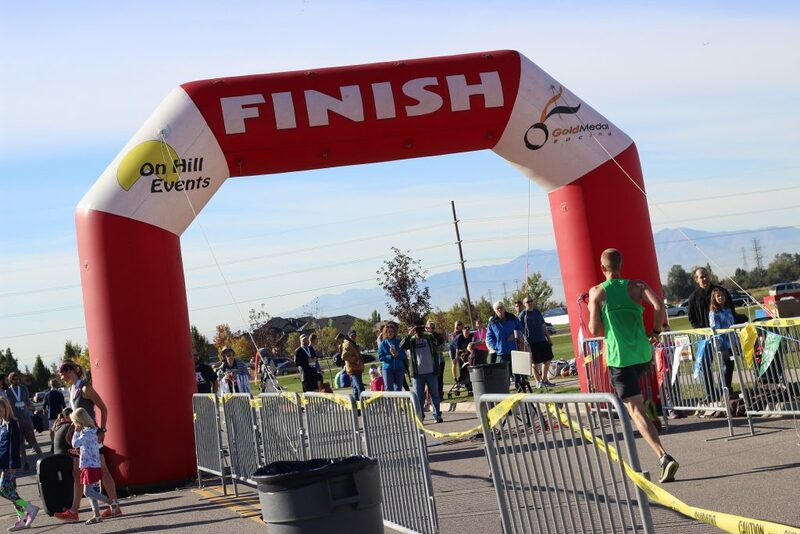 The Layton Marathon course starts on the east side of Antelope Island in the Great Salt Lake. The first 10 miles of the course follow the east coast of the island with the Salt Lake to the right and a ridge rising to the left. On the slopes you may see some herds of Bison grazing. The vegetation is dry and mostly brown. The first 10 miles include some light rolling hills, most of which are probably beneficial since they work slightly different leg muscles on the inclines and declines. There is one notable hill that rises 200 feet or so. At Mile 10 the course turns right and for the next seven miles it follows a causeway across the Great Salt Lake. Note that the lake is not a normal lake — it is really shallow and the water recedes quite a bit from its highest levels. The causeway is straight and flat. Around Mile 17 runners are back on the land and run the rest of the course on large, straight roads, some of which have a gentle incline. Initially the roads are among farms and marshland, but eventually the course starts hitting suburban areas before finally turning to the last stretch near a school and park. The race started right at 7am and I took it easy for the first half mile — clocking in above a 7 minute pace. I didn’t want to go out too fast like I normally do. I was surprised how much I was able to control my pace as I usually have to really restrain myself. A runner named Caleb took off ahead, and there were two other runners near me: a lady who I passed within the first few hundred yards, and a guy named Eddie. I introduced myself to Eddie and we talked a bit. 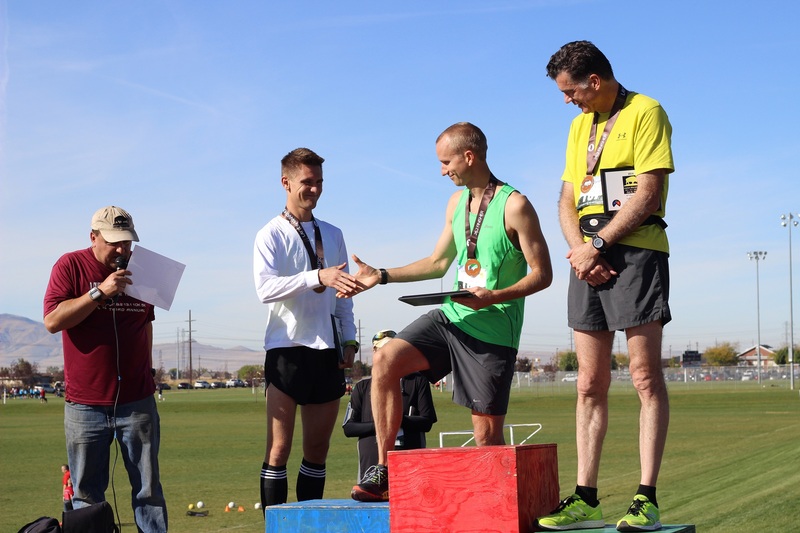 He’d done several half marathons but no full marathons — this was his first. His best Half time was 1:23, so I thought he could potentially be under 3 hours depending on his training regimen. However, I asked if he’d done any “long” runs like 18 or 20 miles and he said he hadn’t. He usually just does 10 or 12 miles per day. That’s still a lot of mileage, but I wasn’t sure if that would give him the endurance required to do a 3 hour marathon. I told him I’d be right around 3 hours if he wanted to stay with me, but after 2 or 3 miles I slowly pulled away. I hit a couple 6:40 miles which is right where I wanted to be at this point in the race. My 4th mile was a bit slower at 6:50, but still in a good range for a 6:45 average. There were some herds of bison to our left which was pretty cool. I also saw several mule deer prancing around the side of the road, across the road, and up the ridge. I was closing in on Caleb, who was leading in 1st place. Mile 5 and 6 were right in line with my target average. The gentle rolling hills were nice — flat enough that they didn’t overwork my legs but inclined enough to mix it up. The view across the lake was pretty nice. The sun was rising over Layton and the whole Wasatch Front, and it was cool to see. I caught Caleb at some point around Mile 5 and learned his name. He hadn’t done a marathon in a couple years. I was amazed to hear he’d done a 35 mile training run just two weeks prior! That either meant he would have plenty of endurance or he’d be a little burned out. He got through the water stations faster than me, so I would lose a little ground on him only to gain it back within a few hundred yards. Starting at Mile 6 there is a 200 foot hill. We both charged up it at a decent pace of just over 7:00/mile. It didn’t feel too strenuous to me, so I was OK with that pace. Besides, I’d recently done some hill training, so I was somewhat prepared for it. Mile 8 was on top of the hill and Caleb and I were still together. I thought I could potentially make a move on the downhill, although I knew we had plenty of miles left to jockey for position. There were a couple bison right next to the road somewhere around mile 8. They are huge! Frankly, I was a little concerned. Fortunately none of them charged us. One of them actually started thundering away when we approached it. I took the downhill pretty hard. Well, I didn’t actually exert myself very much, but I didn’t hold back either. Downhill is a little tricky: your mind wants to slow down, but if you do you’ll actually do more damage to your quads than if you just roll with gravity. I passed Caleb on the downhill portion and clocked a nice sub-6 mile, followed by another fast 6:33 mile as the hill petered out. After Mile 10 we turned onto the causeway and suddenly I needed to use a port-a-potty. This was uncalled for. Only one other time have I taken a bio break during a race, and that was my 3rd marathon (Salt Lake City) back in 2004! Really though, I wasn’t too surprised given my binge eating the previous day. Still, I was mad at myself, especially given that I was within 20 yards of 1st place. Back on the course, I knew that I had plenty of time left to catch Caleb. I looked behind me and couldn’t see anyone, so Eddie wasn’t a present concern. It was actually kind of nice to have a 1 minute buffer with the leader so I could run my own race. My watch was at about 1:29:00 at the half way mark. This meant that I was right on pace for a PR if I didn’t hit the wall, and that includes my break. I then had a thought occur to me: while eating too much the day before cost me a minute break, it also meant that my muscles should be chock full of glycogen. I should have all the energy I needed to PR and then some! I liked this line of thought, and I began to push a little harder. I started passing the half marathon walkers. I cheered some of them on and they did the same for me. This gave me a welcome distraction and also made it harder to see where Caleb was at. Around Mile 16 I was really starting to feel good and I began to gather some speed. Caleb was still a ways ahead, but I was trying to do a sneak attack. I tried keeping half marathoners between him and me in case he looked back. He never did though, he was just focused on his own race. Kudos to him for leading the race for ~20 miles and maintaining a great pace. My mile times were awesome at this point and I was feeling good. I was really closing in on Caleb and I hoped to pass him after the Mile 21 aid station. This would let me take my slow water break and then have a two mile stretch before the next one. It worked out just how I wanted. I was only a couple dozen yards behind him at the aid station. During Mile 22 I finally caught Caleb and passed him. I passed him going fast because I really didn’t want to have to go stride for stride with him. My pace was still pretty healthy at this point and I did another sub 6:40 mile. Then the course started to incline a bit and my legs started to tighten up. I didn’t hit The Wall, but I could definitely feel more resistance. I didn’t know how close behind Caleb was, so I kept pushing. I also realized that I had a good shot at a PR, although my watch was off by ~0.2 miles so it was difficult to tell exactly how good of a PR opportunity I had. My main ambition now was to secure a sub 2:58 finish. The final few miles felt pretty good overall. I didn’t let my pace get too slow. 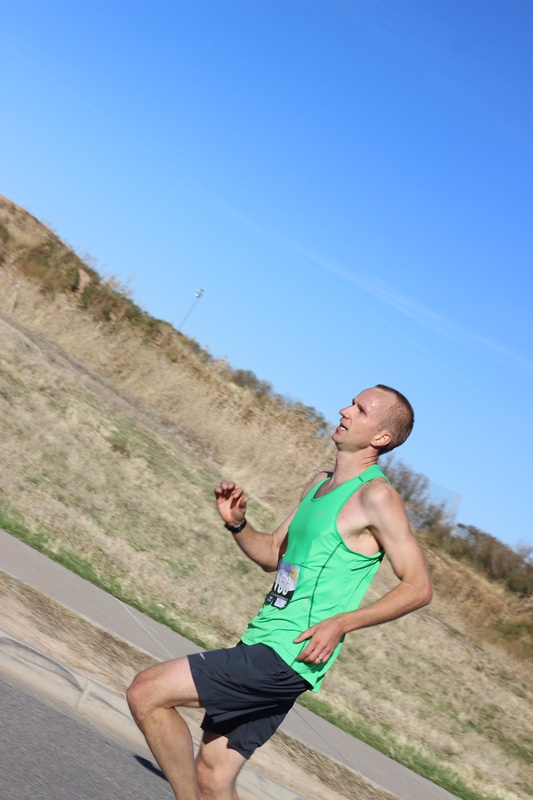 The last mile felt great and I tried to pick it up and leave everything on the course. There’s only so much you can do at this point in the race, but I was ecstatic to be running at a ~6:30 pace for the last mile! Finally I could see the finish line and I sped up even more, doing a sub 6:00 pace for the last few hundred yards. It was nice that there weren’t many half marathoners for my last quarter or half mile (they were spread out), so it was just me and the finish line. There was a small crowd at the finish and they gave me a good cheer. Cyndi was also there and it was great to see her. 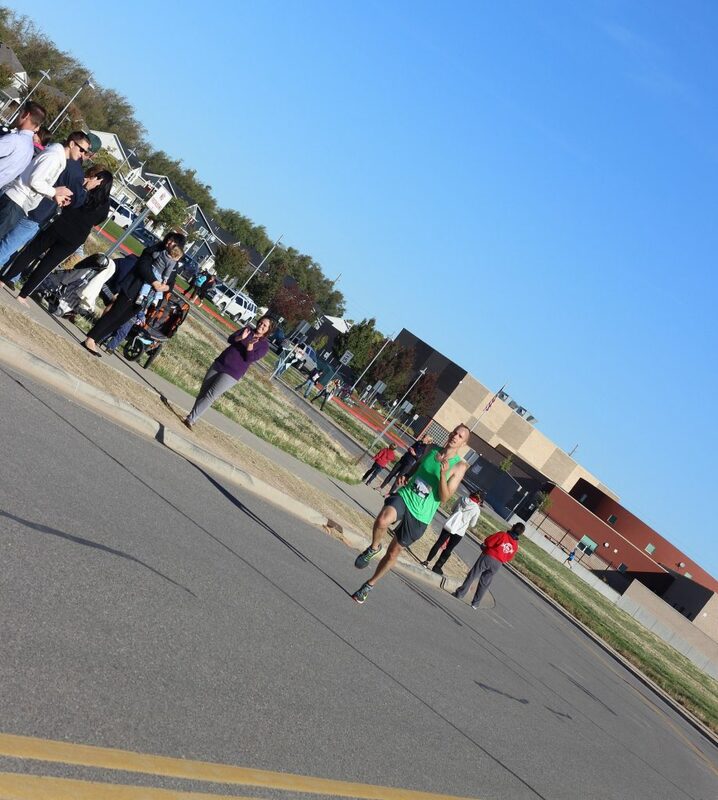 I sprinted into the finish and was happy to see that I got a new PR of 2:57:07 on my 16th marathon+. AND FIRST PLACE! 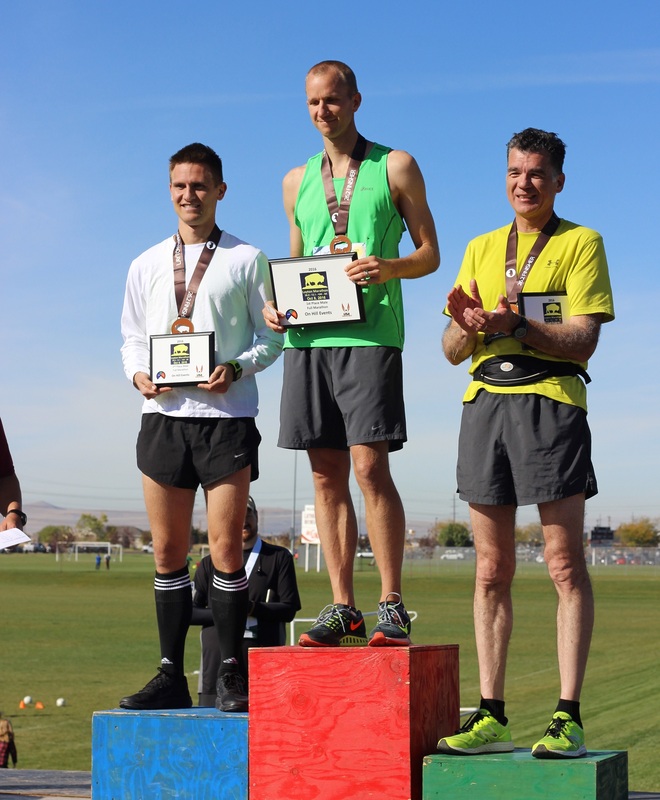 My first 1st place finish at a marathon. I’d gotten 3rd a couple times and 2nd once, but never 1st. It was pretty awesome. I liked the medal as well. Cyndi and I milled around as we waited for the awards ceremony. I took a little walk and tried to stretch out a bit. About 10 minutes after finishing I got that post-marathon-I-want-to-throw-up feeling, but it dissipated and I was able to eat half a PBJ and drink water. I saw Caleb come through and chatted with him. He did great and it was nice to meet him. I’ve never had someone like that to compete with during a marathon. He had hit The Wall around the time I passed him I think, so he finished in 3:03. That was fantastic for a second marathon and I’m sure he’ll improve a lot in the future. After the awards we headed back to my cousin’s where I showered. As we walked away I saw Eddie finishing up around 3:50 and we cheered him on. We gathered the kids and hit the road for the 5 hour trip back to Meridian. I drove for the first three hours then had to take shotgun so I could stretch my legs out. Overall it was a great experience. I was satisfied with my time and especially my place. Despite being a small marathon, there were no significant issues: the bus left on time, the aid stations were well stocked, and they gave awards to all age groups. The course terrain was fast and the scenery was pretty good. I would happily run it again. Nice write-up. 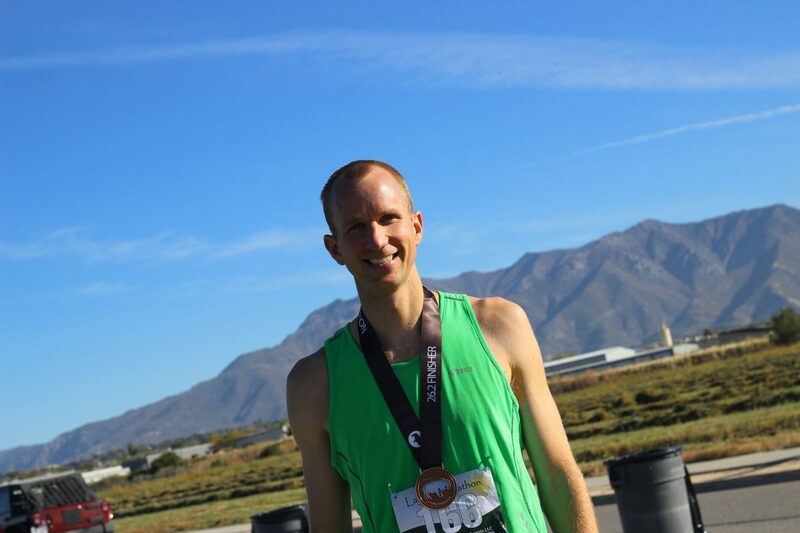 I’ve run the Layton Marathon before and the course is certainly challenging. Congrats on your win. They have since changed the course. I think the entire race is now on the island and you no longer have to run the causeway. Yep, they changed it in 2017. I haven’t ran the new course.